Our investment philosophy is based on the conviction that by actively managing your assets, we can generate added value for you. The focus here is on three sources of return – also called alpha. 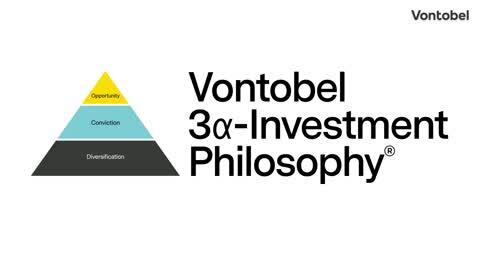 In the Vontobel 3ɑ investment philosophy, the main pillar – the first alpha – is broad diversification, meaning that your assets are spread across several types of investments. This makes a robust asset allocation across different asset classes and currencies possible, and also reduces the typical risks associated with traditional asset classes. Investments that we find convincing in the medium to long term are the second possible source of return, and thus the second alpha of our investment philosophy. Here we focus on quality equities as well as on themes such as economic changes and trends. The third alpha is achieved by taking advantage of short-term investment opportunities. By closely observing the market and flexibly taking action, we are able to react quickly to the smallest developments and create investment opportunity. Depending on the extent to which you want to take advantage of these specific sources of return, you have a choice of different investment options available. Do you have any questions about our investment philosophy? We would be happy to provide you more information and advice.